The Calgary Public Library is a wonderful system with 21 locations spread across the city. 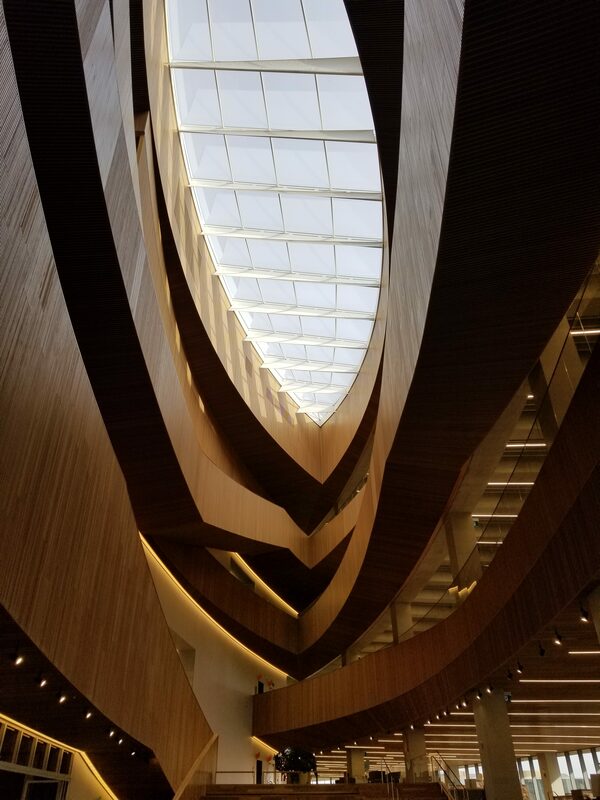 We visited some smaller branches and loved them, but the Calgary Central Library is truly the jewel of the Calgary library system (if not the jewel of the whole city of Calgary). 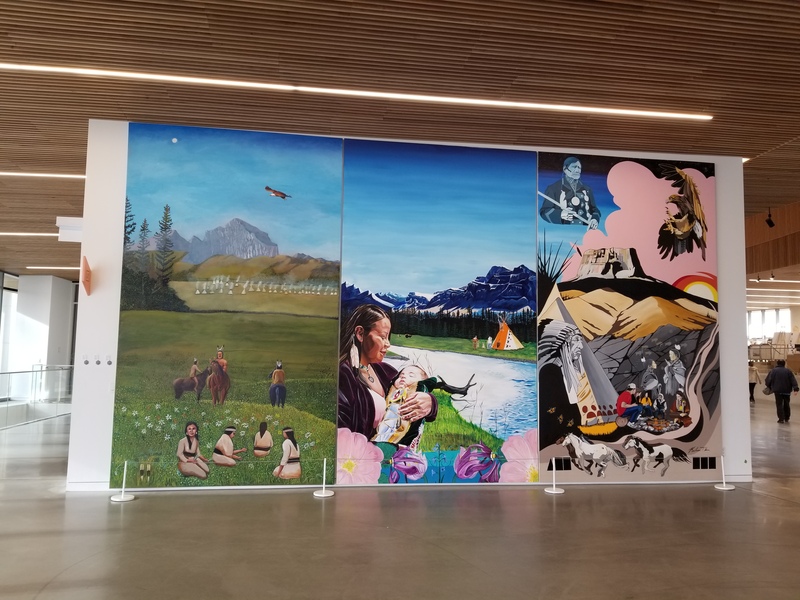 As I enter the library, I’m greeted by gorgeous Indigenous Placemaking paintings; a beautiful, large, and colourful mural that begs the viewer to stay a while and notice the details. I continue into the library, where I simply must stop and admire my surroundings, particularly the beautiful skylight. Friendly volunteers look at me and ask, “is it your first time here?” And I respond with a chuckle, “can you tell?” They offer me two brochures: one is a Visitor Guide and the other is about the building’s architecture. I take some time to look at the brochures before continuing through the beautiful building. 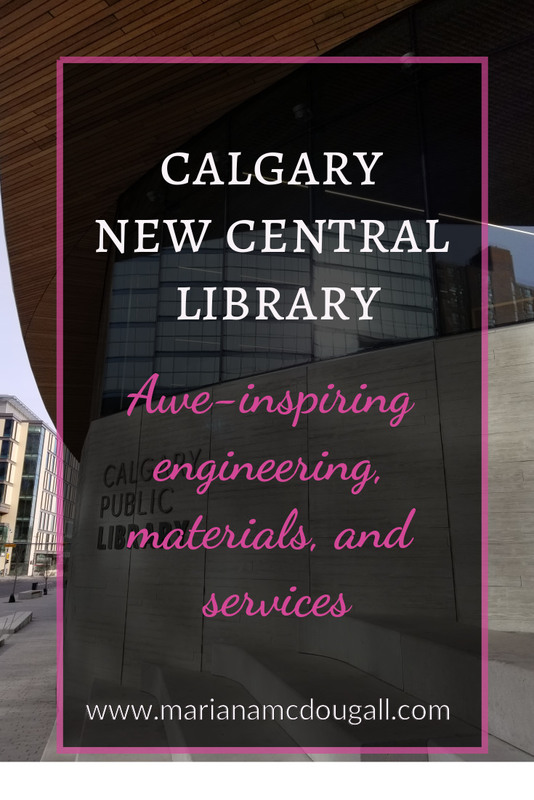 Despite the many stairs, the Calgary Central Library is fully accessible, with exterior and interior elevators, outside ramps, and a sloped walkway on levels 1 and 2. Calgary Central library manages to be practical, gorgeous, artistic, historical, and modern all at the same time. I came here to work, but I simply must take in all the details of this wonderful building before finding a place to sit down. A single afternoon isn’t enough to see everything, but it gives me an overview of one of the best libraries I’ve visited on this trip so far. 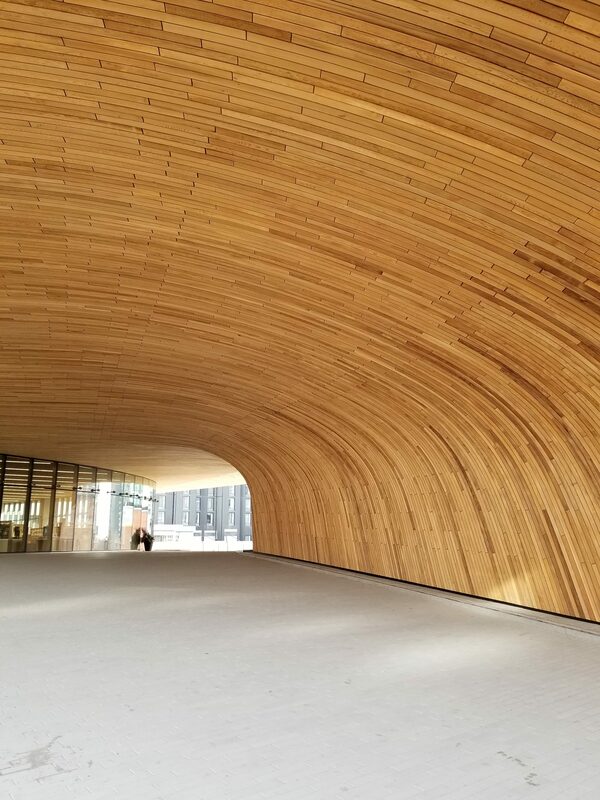 I check out the artistic displays, the many meeting rooms, and the many places to work, read a book, or simply rest within these gorgeous walls. I could spend hours here, observing every detail of the art pieces, picking up books and sitting in one of the many cozy reading spaces. After slowly walking through the building, I find a place to work near the Business Library on Level 3. The slick white tables have a hidden compartment for plugging in a computer and placing the electric cord, leaving plenty of space for my planner and pencil case. The library is bustling in the middle of a workday, but this space is quiet enough. With my headphones and rain sounds, I can block out the little noise there is, and concentrate on getting my freelancing work done. When I need a bit of a break, I grab a tea from Lukes Café, then head to the Children’s Library, where Dan and the children are playing, reading, and exploring. 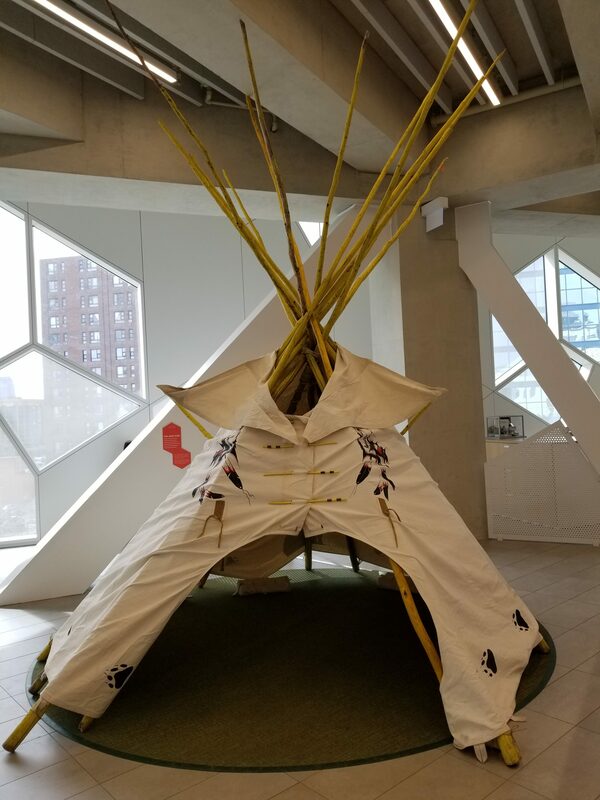 This area of the Calgary Central Library is a beautiful space with a climbing structure and play area, a nursing room, a “Questionarium,” and more. Dan needs to leave the library for a bit, so I stay with the kids and we attend Story Time, which is a lot of fun. It’s obvious the children’s librarian loves her job, and all the kids enjoy her reading and songs. After story time is over, the kids return to play time. M-girl and G-boy climb and play, and K-girl reads a pile of books as usual, though she does enjoy the play area for a bit as well. After reading some books to the kiddos, I head back to a desk to finish up my work for the day. I discover that as a non-resident, you can have 3 hours’ access to the Internet on the library’s computers, or unlimited access on your own devices. If you’re a non-resident, you can also access library materials and services by signing up for a non-resident library card, which costs $25 per household for a 3-month period. The card is free for residents, of course. This library has a tonne of materials and some pretty neat services—including access to recording studios for residents! If you live in Calgary and have a library card, you can try your hand at podcasting in one of their audio recording studios, record a TV show using a video recording studio, and you can work on your editing at one of their post-production studios. Entrepreneur trying to find a space to meet with your mastermind group? Book one of the many meeting rooms. Parent wanting to attend a library program? Don’t worry; the library offers child minding! 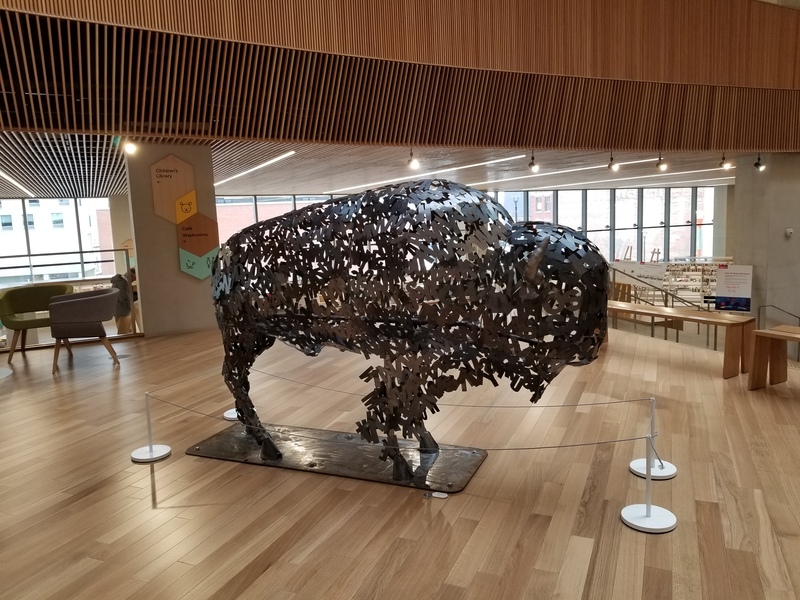 This incredible library is a huge asset to the Calgary community, and if i lived in Calgary, I’d probably be here every week, if not every day. The things I’ve mentioned in this post barely scratch the surface of what the Calgary Public Library offers, both at the central location and at its smaller branches. 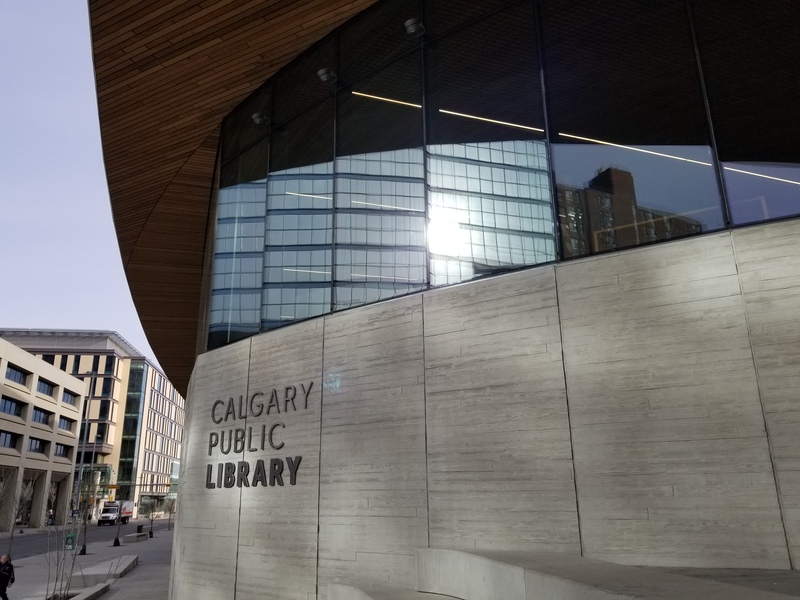 If you live in Calgary and don’t yet have a library card, it’s worth getting one soon, and if you haven’t yet seen this gorgeous new building, which opened in 2018, I highly encourage you to visit—you won’t be disappointed. And if you’re visiting Calgary, make sure you set aside part of your trip time to see this gorgeous building. 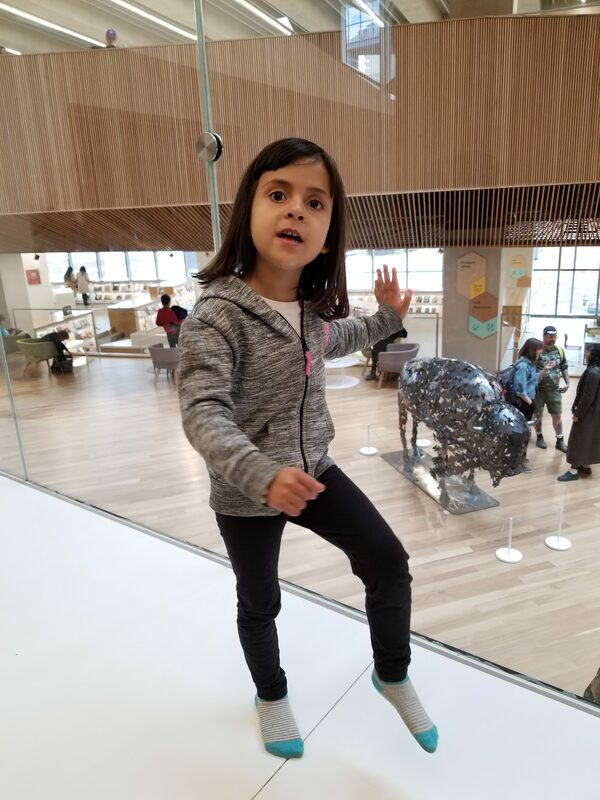 Whether you’re a library fanatic like our family, like architecture, are interested in history, or are an entrepreneur, this library has something to offer every single visitor, Calgary resident and tourists alike. 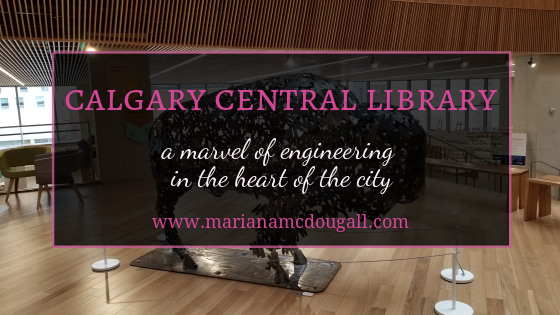 Have you ever been to the Calgary Central Library? What’s your favourite feature?